Drawing is a dream come true. I loved drawing when I was a child but never had the chance to really take a class. Back then, drawing was my way to freedom as imagination could never be fettered. So, thanks to Professor Fick and his class, I could finally start learning the basic techniques of drawing and approach the discipline in a more systematic manner. Without being fully aware, I often found myself spending every Friday night in the living room doing the weekly assignments. My roommate was amazed by how consistent my Friday routine had become. Nevertheless, I had to admit that I could never draw fast. Yet, I never regret my lack of speed in this regard. Maybe, there is something in life that is meant to be slow – drawing, for example. Those Friday nights are the rare moments in my Duke life where I could truly stop multi-tasking and immerse myself in one and only one pleasurable endeavor. I call them the “peaceful escapes”. However, like any new skills that I have acquired after my childhood (supposedly during which time my ability to learn new things has peaked), drawing was immensely hard for me at the beginning. The choice of which pencil/charcoal (5 in total!) to use was too onerous; the touch of charcoal was too hefty; each assignment was too foreign. I was not confident about what and how to draw and express what I see – which could sometimes be frustrating. But when I think about it in another way, somehow I feel pleased with myself: after all, I resemble a navigator with a compass that gives limited direction; I have the entire world to explore if I will. I guess it was only hard because it is limitless. It is interesting that only after I started to draw did I realize how hard it is to put something I saw onto the paper. I felt, for the first time in the past 20 years, that my eyes and brain had been colluding to present a processed perspective of the world for me. This revelation has forced to think deeper about what I see and to observe more closely. In some sense, drawing presents a certain kind of philosophy to me – I am now questioning reality. Yet, as the class progressed, I realized that we not only draw what we see but also piece together objects to creative a narrative that might not be real. It is no longer about reality; it extends to the realm of imagination. And that has been my favorite part of this class. For the second last assignment, I depicted the Duke East Campus as a farm; there is a very athletic pig jumping the fence, an innocent-looking cow staring at the audience, and a snake spiraling around a cute cat. What I tried to accomplish in this painting is to challenge the conventional wisdom and the stereotypes towards animals. In some way, the painting challenges the stereotypes present in society in general. E.g. overweight people, malicious-looking people, social classes, etc. For the last assignment, I played around with the concept of space and time. The bridge is linking the present with the past, each symbolized by two architectures. The unlikely structure and the spinning top are symbols of unreality or dream. Also, another theme of the painting is that the French building symbolizes the Golden Age where great ideas were born and intellectual curiosity was at its peak in France; this is juxtaposed with the Duke Campus. The irony here is that Duke students have been increasingly career-anxious and the intellectual curiosity of the student body has been disappointing. In one word, there are a lot of symbolisms in this work and different people might have different responses. While compiling the past assignments into a portfolio in class today, I am proud of how far I have progressed. It is not just about the techniques but also the way to express my views and imaginations through symbols chosen with purposes. Thank you professor! I used to draw a lot as a child, focusing mainly on pausing the the tv while watching a cartoon and then drawing that. However, since those elementary and middle school days, I have not consistently drawn for a long period of time. The only major drawings I have worked on recently occurred in high school wen I made a poster sized Ironman drawing for my geometry class. I like how good it turned out, so I later decided to do one more poster sized drawing of bumblebee (from the transformers movies). Those projects took hours upon hours of drawing and coloring, and I still have not finished the bumblebee project. With that in mind, I am very thankful that I took this drawing class. It has forced me to develop my talents and draw on a very consistent basis; and looking back, I see that I have become a much better artist. Initially I was a little bored with the in class assignments where we drew the same piece over several weeks. The initial assignments also didn't particularly pick my interests since the subjects were just everyday objects in our room, I will say that I really like how my shading and value drawing come out, particularly the dress shirt because it ended up being more difficult than I expected and I spent a lot of time on it. After that, I really started enjoying the class when we were given longer 2 week projects that started with the perspective view. I also really liked the sketchbook because I could draw whatever I want, and I was able to stretch myself by drawing subjects like humans, practicing using charcoal etc. Comparing my later sketches to my initial ones, I do believe that my drawing skills have improved. Part of that is from gaining the realization of the importance of the tools and materials used in artwork. Previously I had always simply used #2 pencils and white paper for my drawings. Now as I am attempting more difficult and realistic drawings, I see that I will need to expand the tools I use (pencil types, different erasers types, paper materials etc) in order to be successful. I also realize that I have gotten faster at drawing (this was one of the things I hoped would happen coming into this class). Looking in my sketchbooks, some of the drawings that took me 1.5-2 hours in the beginning I can now probably do in 45min to an hour. The reason for this is that my approach to making a drawing as changed. Before I always leaned towards making an overall outline and then going in to draw the inside details, but one day I realized that it would me easier if I start from a specific detail and then work my way outwards. With this method, it is much easier to keep the proportions in the drawings because I have an initial reference and work my way out from it. With the former method, it is almost impossible to get an outline shape exactly on the first try, and I would end up constantly erasing and redrawing certain parts as I added in details, greatly increasing the time used. So overall this is been a very good experience for me, and it encourages me to want to draw more in my free time and develop my talents. I love drawing. Already as a child in primary school I wouldn’t want to leave in the afternoons because I was busy drawing. My first exposure to drawing classes was in grammar school in Germany. But it was a required class and most people didn’t really put effort into their work. Although I loved the subject, I didn’t like the atmosphere in the class. In 10th grade I started with actual “art classes”. These were not simple curriculum requirements but instead taking by students who actually wanted to learn more about art. I took one trimester of photography, one of sculpture and one of ceramics. I loved them but it wasn’t quite what I was looking for in terms of arts. In 11th and 12th grade I finally got to draw and paint. Studio Art (both years) was one of my favorite classes in high school. It was relaxing and so enjoyable because everyone in the class was very focused and dedicated. Coming to Duke, as a premed, I started with a lot of science classes and with some freshman requirements sprinkled in. The first semester freshman year I didn’t do any art until Christmas break came around. Sitting at home and making Christmas cards I realized that I was missing art - so much. In the beginning of the second semester I told myself I’d go to the arts annex regularly and draw. But I ended up being so busy with class work that I never did it. I only went to one rush event of the SLG Arts Theme House and painted a horse on canvas there. I had the best Friday night in a long time doing that and I was so proud of the outcome. Therefore, this semester I decided to take Drawing 199, not only to fulfill my ALP requirement but also to “force” myself to draw on a regular basis. Even though I was overloading, I was hoping that it would be a good change of pace for me next to my science classes. The topic of the class also really appealed to me because I’ve never been much of an abstract drawer. I always drew what I saw in front of me or what I saw on photographs. Therefore, I especially enjoyed the last two drawings, for which I could be more creative and expand beyond objects from my room. I got a little bored of drawing similar objects over and over again, so getting out to draw somewhere on campus was a wonderful change for me. I was able to challenge myself with the class in a very different way than I challenge myself in my pre-med classes. I had never worked with line value before, nor had I done a negative space drawing or drawn big spaces and buildings. I also challenged myself with different media (pencil and charcoal) to figure out which one I was most comfortable with and with which I needed more practice. Pencil was more precise, which was a great advantage for me because I love detail. But the fact that I was able to erase all my lines without leaving much of a trace made me question every line I drew, so that I redrew it over and over again. Charcoal on the other hand left traces, so that I kept erasing and redoing lines at a minimum and focused on getting everything right the first time. Moreover, charcoal also allowed for more intense shading, which I really liked. Since both media have benefits and drawbacks, alternated between using them and my use of charcoal especially in my quicker study drawings. I could see my improvement throughout the course as I learned more and more techniques and was able to apply them to the subsequent assignments. I am especially proud of my final drawing, I think that is the best drawing work I’ve done in a long time. Even though this class was more work than I expected it to be, I am still glad that I took it to “force myself to draw”. Now that I’m in the habit of doing it again, I believe that I will be able to draw on my own next semester. I’ve seen how much I improve by simply drawing one picture once a week and I’ve also realized how relaxing drawing is as a balance to my science-heavy classes. Therefore, I’m really happy that I took the class to bring drawing back into my life. Growing up, making art was something I did almost exclusively with my dad. He is a painter (by profession now that he's quit his job to pursue it full time) and he always encouraged me to follow suit. Unfortunately, I have absolutely no clue how to paint things. He has tried to teach me watercolor a few times, but I like the idea of oil paints better I think. Anyway, that is a journey for another time. The point is that while I did not take to painting, I eventually developed an appreciation for sketching. I was always frustrated by how long it took to produce something I was satisfied with, so this was not an every day thing. In fact, it was mostly only around gift-giving opportunities, because there was nothing my dad wanted more than original art. On those occasions I didn't mind spending the time; it felt good to make him happy. But I still didn't have a passion for drawing on my own. I don't know if you can create such a passion out of willpower, but I decided more practice could be a good start. I really wanted to improve my drawing abilities so that it would be less frustrating, but that takes practice, which is the frustrating part! It's a loop that doesn't end in more artwork. So I decided that if I signed up for a drawing class it would force me to practice, and by the end I would hopefully have improved and be able to enjoy making art more. This class has taught me many valuable drawing skills and stretched my comfort with through the focuses of the various assignments. My drawing experience in high school was highly specialized in the sense that I was only comfortable with a few kinds of drawings. I enjoyed drawing people and still lifes, but landscapes and linear perspective drawings never had much appeal in my eyes. The assignments this semester allowed me to explore these areas of drawing and to develop skills anywhere from empirical perspective to learning to describe trees without being overwhelmed with every detail. These skills could not have been learned if I had stuck to my narrow niche in drawing. Beyond the assignments, one concept of drawing that I had never made much use of before this class was the study drawings. I often forget that drawing can be a useful first step in gathering and organizing your thoughts. It was nice to be able to roughly draft a drawing without attempting to perfect each detail. With the endless amount of work and the fast paced nature of Duke academics, slowing down to collect thoughts before an artwork was refreshing. I had taken numerous art classes throughout high school, but upon coming to college I assumed that there would be no time to continue drawing. While I cannot take a drawing class every semester at Duke due to scheduling constraints, I am very glad that I had the opportunity to engage in drawing again. Drawing may not be a necessary skill in my current field of study or in future jobs, but I hope to continue to make time for drawing in the future. 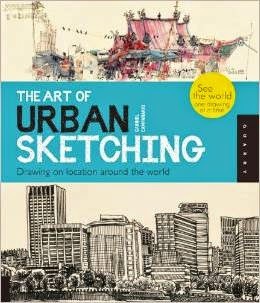 This semester one of my favorite books to flip through has been The Art of Urban Sketching, a book comprised of sketches from artists in cities around the world. Included are annotations by the artists about their process of sketching and even what materials and strategies they recommend. I believe this is the webpage for a related drawing blog. Most of the drawings took artists between 15 minutes and three hours to sketch. Some are proefessional illustrators, architects, or simply enjoy sketching as a hobby. Their styles vary tremendously. A standout quote from the book was, “Since the real world rarely looks like its made of fine, black and white lines the sketcher is constantly creating visual metaphor what he’s seeing” writes Walt Taylor (p. 270). This has been helpful quote to keep in mind during the course of Drawing 199. As I have recognized the power of one single line if contrast and juxtaposition are also applied in the drawing. 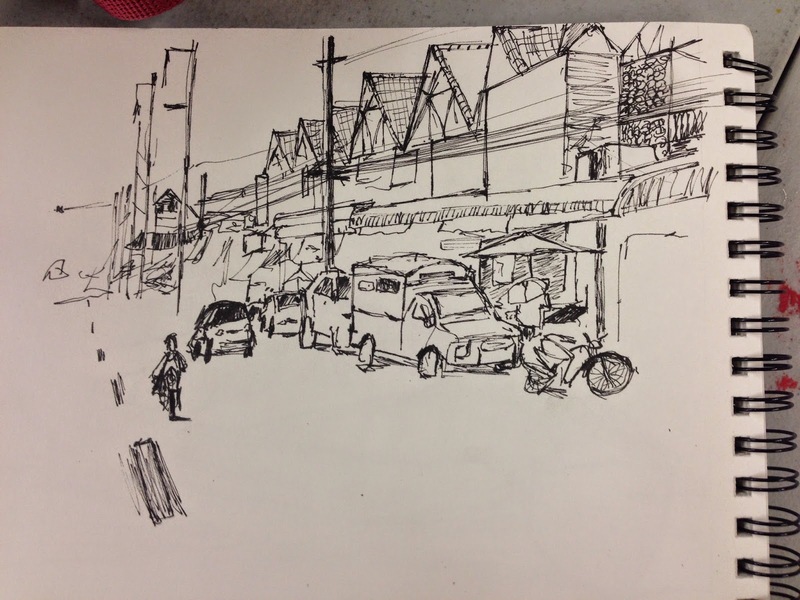 There are a few artists that stood out to me while scanning through The Art of Urban Sketching. One of them is Ch’ng Kiah Kiean who draws urban landscapes of Penang, Malaysia. He includes a lot of texture and has a very distinctive style. The smudging of graphite next to short pricks help to give transitions to elements in the drawing. In his drawings I also notice how excluding some information about the urban scene can focus or guide the viewer on other elements. Another sketcher from New York, Danielle McManus, incorporates the impression of movement in her artwork. In the the metropolitan museum of art. The vertical points of buildings are not drawn perpendicular to the page and there are, for instance, many lines representing one edge of a building. This style of sketching lends more movement and liveliness to the drawing. Experiencing the drawing does not feel like you are limited to one viewpoint. The drawings of Stuart Kerr also convey a sort of informality. He uses spots of color in strategic points in the drawing that make more incomplete, but also captivated effect. Another sketcher - Juliana Russo- suggests that you don’t think of the framing meticulously starting. Rather it is rewarding starting a sketch without knowing how the drawing will fill the page (93). For all these artists the mediums they use to sketch are a foundation for their style. For instance I enjoy the effect that Pentel brush pen or the use of fountain pen. In The Art of Urban Sketching some artists note that they use brush pens to denote landscape and trees. The Duke Union offered a figure drawing that I attended this semester. It included short and fast paced sessions of drawing the human body. This workshop helped out my sketching ability. For developing a drawing style, short drawing time is helpful because the goal is to get as much information down on paper. Style seems to come naturally when there is no time to consider it. With longer drawing sessions I find that I spend less spend more and more time questioning drawing choices. This studio experience and working in my sketchbook has helped loosen up my drawing style and increased the efficiency of my drawing sessions. While style and technique is important for drawing, observation is a skill I have found most challenging, but most rewarding to improve. Another student blogged earlier about how you have to go against instinct in order to measure what is there, not what you subjectively assume is there. Observation is key to understanding urban spaces. It is like a type of listening. So often I learn by looking at a screen. Especially for coursework in the Visual and Media Studies major, the focal point is digital forms; the powerpoint projection, the computer screen. I constantly discover with the aid of digital technology especially with software like AutoCAD, Photshop, Sketchup and even geospatial programs like ArcGIS. Drawing has offered a different experience. To absorb information by observing reality rather than its representation has been valuable, freeing, and has provided a foundation to digital forms of drawing like AutoCAD. I have always been enjoying doodling and sketching since I was a kid. When I saw something interesting from a book, a piece of newspaper, or just from outside the window, I sketch it on a random piece of paper and present it the way I like. Even these days, when I was going through my high school notebooks, I found random doodles and sketch in them and that reminds me of what I saw or do on a specific day. Drawing to me is another way to record my life. Although I have never taken any professional training class, drawing and designing became things I love to do and I somehow enjoy the “none-perfect” sketches I have. Comparing to movies, books are always more attractive to me because while reading everyone seems to have a different vague image in their mind of the characters, objects, and environments. Drawing to me is sometimes like writing a book: no matter what you want to present with your drawing, people are going to see different things based on their own experience and preference and have different stories going on in their mind. Even when I was looking at my own sketches from a long time ago, I read different things from them. I think at some point this is what drawing attracting me the most because it is not telling a fixed story but presenting some images and let the audience create their own stories. This semester’s drawing class is definitely rewarding. Before this class, I have never drawn landscape and still life. When I was doing random drawing in the past, I didn’t really look into the details of the objects and try to present what I saw precisely. I used to look at the things and draw how I thought it would be instead what I saw with my eyes. The still life practice and the landscape drawing do not only let me touch the drawing techniques but also enable me to draw what I see as it is and make me realize the importance of observation and details. I had never drawn a landscape before this semester. To do so never once crossed my mind. As someone who almost always sees the world around me through the slight blur of stubbornness caused by refusing to wear my glasses, the sharp details of distant leaves matter infinitely less than the countless shades of yellow that appear when the sun strikes them at a thousand different angles. Why would anyone bother to draw a sky? Gray can never tell you whether there were hints of rose on the horizon, or how an orange sun burned through smoky purple clouds. My biomedical instrumentation professor informed us that the human eye can see ten million colors and exactly fifty shades of gray. Yes, we all sniggered. But the point is that there is so much that simply cannot be done with pencil or charcoal, and that frustrates me to no end. Don't misunderstand me, I love drawing. I feel far more comfortable with a pencil in hand than a brush, because the former is the skill I have more thoroughly developed, and I can be a bit of a control freak. And there are some images that strike me as perfect for a bold, monochromatic image. Yet I have never once seen a landscape and thought to myself, "I can capture the true beauty of that in a drawing." After being forced to try three times now this semester, my opinion is unchanged. I am however, glad for being compelled to attempt it. I'm not satisfied with how those attempts came out, but that's just par for the course for a perfectionist like me. But it took being threatened with a grade to remind me how much I love drawing - how relaxing and enjoyable it is (when it's not being frustrating and incorrigibly time consuming, naturally). I certainly haven't decided to change my life plans and become an artist, but I was inspired to take the coupon we were given on the first day of class and venture off to find Happy Mess Art, I was motivated to get that set of watercolors in addition to restocking me charcoal supply, and I was spurred to set my long forgotten brushes to paper to satisfy the hunger for color that week after week of producing nothing but gray created in me. I really do miss color in this class. However, this class has done more than make me resent being limited to two media. I honestly wasn't expecting my drawing skills to improve much this semester. I don't mean that in an arrogant, "my drawing has no room for improvement because it's already perfect" way. I just didn't think that an art class without much one on one instruction would be much more than a stress release. Firstly, this class was more often a stress creator, but I digress. The point is that I do feel as though my drawing skills themselves have improved, as Professor Fick said, just by practicing, and for that I am grateful. I suppose my main thought on drawing at Duke, is that I should keep doing it, and that I'm going to keep doing it, and I think that's a pretty great thought to have. I had very little experience drawing before this class. I've always been extremely interested in drawing, but I've never believed that I could actually do it. I finally decided to sign up for this class to try and improve my skills, and I am extremely glad that I did. Being forced to draw so much in the sketchbook and for the projects has improved my drawing immensely. I have really enjoyed having a sketchbook and being able to draw, and I wish I had more time to draw more. The class was definitely a much larger time commitment then I initially thought. This semester would have been much easier if I had taken an elective with a much smaller time commitment, but I would not have learned as much as I did or grown as much as an artist had I done that. I definitely hope to continue my progress as an artist by continuing to draw. Even just a small sketch can help a lot. This year I took four engineering classes as well as this class, and the change from science and math heavy courses to a more creative course was extremely nice. It was a needed break from the constant engineering, and whether or not I continue to take more drawing classes I will definitely continue drawing as a sort of stress relief. It was nice to be able to do something that did not necessarily have a right or wrong answer. Nothing I did was necessarily wrong, yet there was definitely a way that it could have been done better. Finding out how to create something in a better, more realistic way was both challenging and interesting. Drawing is something that I can continue to expand my abilities in as time goes on. While I did not have any formal art experience, I believe this has been a great experience that has shown I am not completely inept at art. It is something that I still have plenty of room to grow into, but it is also something that I very much enjoy and will have fun expanding. This class has given me the confidence to draw and not care how others view it, as long as I know I am growing and expanding my abilities. Through this I hope to further improve my drawing skills outside of class. Yes, draw something. Drawing is the artist’s depiction of reality. Each brushstroke is an equation, a universal law, the explanation for why a leaf falls in the winter in the wind. When I draw, there’s no need to second-guess myself. I don’t have to think twice about what a professor who lived two hundred years ago has to say about my interpretation of reality. To me, my drawing is how I see my world, and it is perfectly fine with me if Newton would contest the shapes of my shadows. I drew what I saw, or even sometimes, just what I wanted to see. And that worked. My answer was right just because I wanted it to be and I was free to write the rules. My only limitation was the size of my paper and the tools that I put to its glaring, white nothingness. There’s something empowering about creating with your own two hands. You’re in the trenches, charcoal staining your skin, eraser peels littering your sweatshirt, until you vanquish the empty space between the lines. After long hours, you’ve earned the right to finish your story and hang it for all to see: a memento from an ancient battle. Drawing gives me a creative freedom that inspires me to question the rules and inspire others. After discovering that my right brain can compete with my left brain, it’s time I challenged other engineers to think outside of the… page. As an art history major at Duke, I have always appreciated art and especially drawing as the foundation of any good piece. After taking this course, I have developed an even stronger appreciation for drawing, and the patience and practice it takes to develop such skills. I think that I will now approach any work of art with a new perspective. I enjoyed the first blog post because it was an opportunity for me to really learn about an artist whose work I am attracted to, and see how drawing is the fundamentals for any good work of art. In high school I took several art classes, but my college experience has been more devoted to studying art then practicing it. This class has been a really great opportunity for me to re-immerse myself in the practice of art, and has been conducive to my growth as an artist. Each assignment taught me something new, and each time I was encouraged to experiment with new techniques – both successfully and sometimes unsuccessfully. What I enjoyed most about this course was the class time in which we discussed everyone’s work. Hearing both Professor Fick and my fellow classmates’ critiques helped me improve my own work, and also seeing other people’s drawings gave me ideas for techniques that I want to explore in the future. For instance, I initially struggled with shading, but after seeing how others were able to use pencil or charcoal and blend it, I think my shading skills improved dramatically. I think that my strength as an artist is in drawing very delineated forms and objects such as the brickwork on Duke’s buildings. I struggle with more organic forms, such as trees and leaves. It was really helpful to be able to see how my classmates approached drawing such subjects, and it gave me ideas for how to improve upon my own. I've had an incredible experience in drawing class this semester. The past few semesters I had wanted to take a visual art class but I did not have the availability in my schedule. I hadn't realized how much I would get out of the course until now. It helped me grow artistically, challenging my creativity along with my visual skills. Each project enabled me to take what I had learned from the previous project and build it into the existing one. Each project required a use of visual space and perspective, taking elements found on their own and combining them into a final product and creative vision thought out in my head. The most challenging project for me was the final project, I had difficulty taking the "unreal"/ "sci-fi" characters and placing them in a realistic space. The second take-away was that each project allowed my brain to wander into a creative space, one in which I could relax and just think about the task at hand, putting the pencil to paper. This was a relaxing change for me, i'm used to taking science based classes with labs in which there are only specific answers to homework and projects given. This class was completely different in that there are no solid answers, every project is up to our own interpretation and the best results come when the most time is devoted to the project. Finally, the class required that I think critically of not only my own art but the art of others. I gained artistic language that allowed me to offer advice to my fellow peers in class, working as a class in offering suggestions to better each others final products. It was so fun to watch the growth of everyone in our projects throughout the semester!! Over the course of the semester, my opinion has changed on drawing. At first, I really thought things were going well when we were just doing line drawings. I was impressed with what I was able to produce, and I thought the experience of drawing in class was really helpful because I was able to get direct feedback from Prof. Fick. When we transitioned into charcoal and shading, I think my work struggled because while I was spending multiple hours on my pieces, they just weren't at the same talent level as previously. This was definitely a learning curve for me, because I would end up being frustrated with my final drawings. I would spend hours on one piece, and then at the end would still feel as though it wasn't up to par. I think I started to get the hang of it when we were doing one drawing a week. I started dedicating significantly more time to my drawings, and I think that the results showed. I liked having the opportunity to really get feedback from my classmates and from Prof. Fick for the last few drawings (it gave me great ideas which really helped my work!). I am especially proud of my last drawing--I think it really shows how far I have come in one semester. I learned a lot!! I also think that taking this class has helped shape my perspective on the way I see things on Duke's campus. When I had to decide on different landscapes to draw, I really considered the spatial distribution of objects and buildings on campus. My eye became attuned to seeing what was really in front of me and the way I would be able to interpret that with my pencil on paper. I thought it was a really cool exercise forcing myself to consider what I would be best suited to draw--what was in the foreground, how could I interpret detail in the distance, how would I use shading to make the scene look real. I now walk around campus and really challenge myself to see what is in front of me--when presented with the challenge of drawing something, it really makes you consider what is actually there. Overall, I really enjoyed the class. It was definitely time consuming and at times really frustrating, but all in all I think I improved a lot and learned from my experience. I would suggest the course to anyone who has the time to dedicate to the drawings and is interested in seeing Duke in a whole new way! Before taking this class, I did not have any formal artistic education, aside from the mandatory art classes in elementary school. My primary interest in drawing arose as a hobby in middle school, though I am sure that I doodled before then, and I continued with it throughout high school and some into college. However, the workload of being a premed at Duke, as I am sure many of my fellow students in the class know, leaves little time for relaxation due to the intensive course requirements and the extracurricular engagements needed to build a strong application. I found myself neglecting one of my favorite past-times, managing to draw primarily only during the school breaks. Luckily though, I managed to get all of my course requirements (both graduation and premed) out of the way early on in my academic career, and so I finally had the liberty to choose courses that interested me. When I saw this class on ACES it immediately caught my attention, as it would allow me to once again pick up drawing. I initially had mixed feelings about taking a formal drawing class, as I was not sure of what to expect. Luckily though this class turned out to be great. Before this class the subjects of my drawings were all sci-fi or fantasy, and while I did continue to depict creations of my imagination in my sketchbook I was not upset by the class' emphasis on drawing from observation. I saw this as an expansion on what I was comfortable with and a challenge to create accurate representations of the world in my art. I liked the structure of the class and how each week we built on what we had learned from the previous one. Coming into the class I was only comfortable with line drawing, and that was without any of the variation in intensity that I learned about in class, and I had only been experimenting with shading for a month at most. In addition to learning all of the techniques, my confidence in my drawing ability increased greatly and I found myself relying less on my eraser as the semester progressed, and I was not afraid to experiment with different techniques. Unfortunately I did not have this confidence when we started working with charcoal and as a result I do not think I spent enough time practicing with that medium as I think I would like to now. I really enjoyed this class. The techniques we learned were varied and helped develop a wide range of aspects in drawing, but I think what I truly value in the class is how it made me more confident and willing to take risks in my drawings. I was daunted with the initial projects of the semester because I was afraid of making mistakes, and I remember finding myself trying to use my pencil as an exact ruler when we learned this technique for fear of my drawing not being perfect. However, with more practice I learned to be better at getting an overall feel of the objects I was drawing and to perceive their proportions. For me, drawing is a way to relax and to transform my thoughts into entities that exists in reality. As a kid I used to enjoy drawing and sharing my work with my siblings, each of us trying to come up with cooler things than the other. Now, I use drawing as a way to express my creativity and to relax. I am extremely glad that I took this class. I feel that now I can draw things from observation and that I will be able to use this to help me in my fictional drawings by using real-life objects as a reference for something imaginary, and in addition I feel that I have improved my drawing technique due to both the confidence and the new set of skills this class has provided me with. Thank you Professor Fick!